APQFFA member delegates pose with winner of Best Short Film Prize. 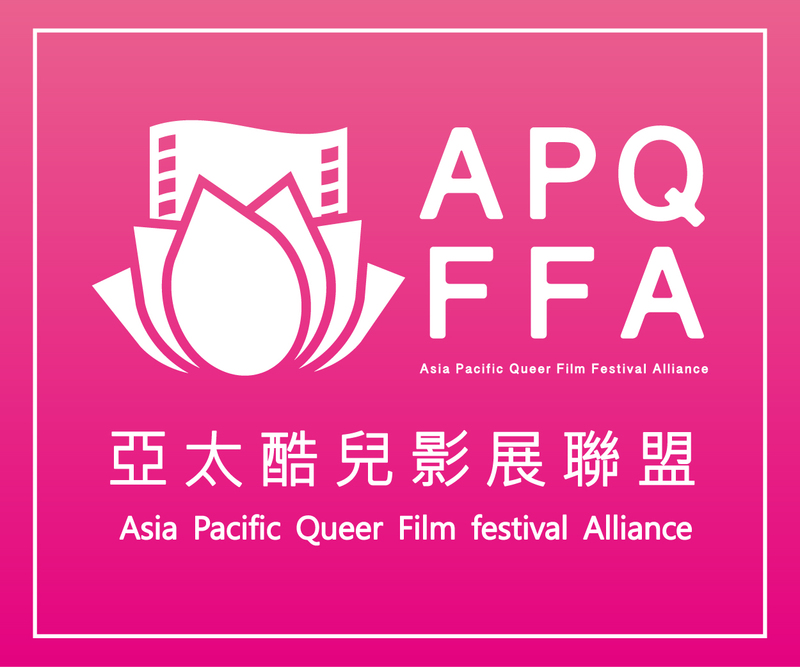 In 2015, the Asia Pacific Queer Film Festival Alliance (APQFFA) was created in Taiwan. On Oct 22, the 2017 APQFFA Best Short Prize was ceremoniously announced. With 24 members (stretching up north in Japan; down south to Australia; as far west to India; to east in Hawaii) nominating the best films from: India (Any Other Day), Philippines (Aren’t We Here For Each Other), China (Cocoon), Hong Kong (Goodbye Mr B! Hello Ms. B! ), South Korea (Momo), Australia (You Deserve Everything). 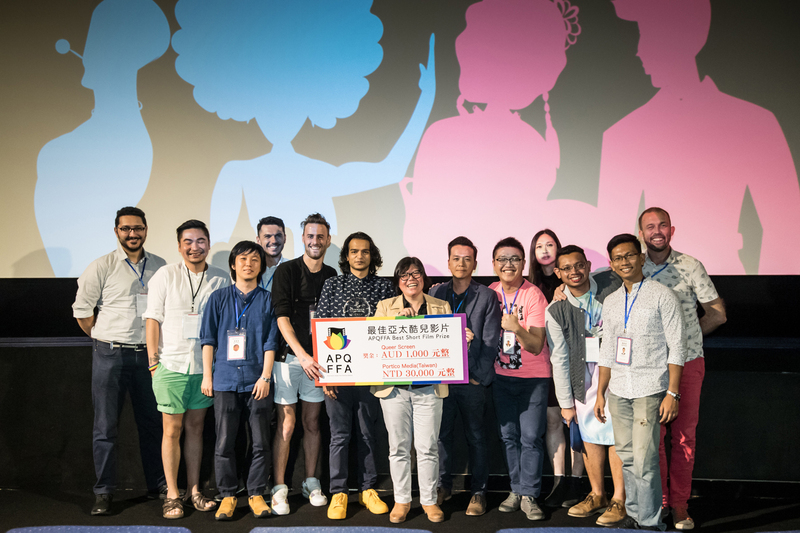 Taiwan International Queer Film Festival festival director, Vita Lin, presented the APQFFA Best Short Film Award to the winner, Vikrant Dhote’s, Any Other Day, taking the AUD2000 offered by Australia’s Queer Screen and Portico Media. Director Dhote’s Mother was invited to share his victorious moment, “Thank you all, this award is for everyone.” She hoped every parent can support and their children in their journey. Following the APQFFA Award ceremony was the special screening, “Party for the ‘Perverted’”, replete with 5 drag queens regaling the audience throughout the screening of The Adventures of Priscilla, Queen of the Desert, dancing to the music. At post-screening, a commotion was stirred with the audience clamoring for pictures with the drag queens, capturing many unforgettable memories. Since the inception of Taiwan International Queer Film Festival (TIQFF) in 2014, and the founding of APQFFA in 2015, the Alliance has grown from 10 members to 24 members in the Asia Pacific region, serving as a platform and a hub to share and support resources. Every year, each member country selects a film, enter a voting process, and selects the best film, and the hosting festival director presents the “Best Short Film” award to the winner. The winner of this year’s award: Any Other Day, represented by India, portrays 2 men stopped by police on the side of the road, using clean and simple plotlines depicting the everyday violence. As night deepens, the Philippines nomination, Aren’t We Here For Each Other offers a brief glimpse in the life of a drug peddling queer couple. Cocoon, the nomination from China, offers a nostalgic look into China in 1997 from the perspective of an 11 year old child on the cusp of puberty, and discovery of her mother’s secret. The nomination from Hong Kong, Goodbye MR. B Hello MS. B!, documents director Beatrice Wong’s own transition from Mr. Wong to Ms. Wong. South Korea’s nomination, Momo, depicts a long distance relationship between two women, the pet cat they keep forces them to contemplate their relationship. You Deserve Everything, the Australian nomination, depicts the relationship between a doctor and his Arabic interpreter, but all is not what it seems. The digitally restored The Adventures of Priscilla, Queen of the Desert, portrays the ups and downs of a trio of drag queen performers travelling through Australia to the destination of their new job. Many of ABBA’s songs are featured in the film, with actor Hugo Weaving as one of the protagonists appearing in drag, in one of the most camp films in queer film history. The Oct 22 Taipei screening had 5 drag queens break into the theatre, danced along to the film’s score with many outfits and dance routines. The audience clamored for photos with the drag queens at the end of Priscilla to keep a record of such a memorable night. There will be a 2nd screening of Priscilla on Oct 27 22:30, for those that missed the first party.